The warm season has come! Don’t lose the opportunity to start it in the best way with Argentario Divers! Choose the best offer for you and your family. 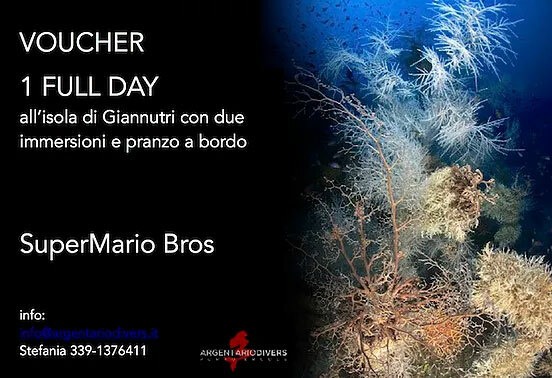 With Argentario Divers you have a wide range of promotions that will let you do beautiful dives in Giannutri and Giglio Islands, and along the coast of Argentario. Not only! On our boats there’s space for everyone, grown-ups and kids, with us you can make your holidays funnier. You only have to send a mail at info@argentariodivers.it, we will send you prices and more details. Don’t lose the opportunity to surprise your family and friends! Boat trip, 2 dives, air tanks, guide on request, Argentario Divers assistance. Free shuttle from parking and camper areas, breakfast, lunch and open bar, bathroom with hot shower and hairdryer, Argentario Divers assistance. The price doesn’t change if the diver decides not to dive. It is recommended to bring your own weightbelt. The package includes: tanks, weightbelt, boat trip and guide. Afternoon dive, evening appetizer, night dive and dinner under the stars. The package includes: 6 dives, breakfast, snack, lunch, open bar on board, tanks, weigtbelt and dive guide; two nights in hotel or B&B. Includes: tanks, weightbelt and boat trip. It opens to you the door of an extraordinary world, funny and exciting! Breathing underwater for the first time, trying the emotion of being weightless and watching never seen before colors! First step of a course that teaches you how to dive independently. You will discover the underwater world, with the supervision of qualified instructors. This course gives you an internationally recognized license. You will obtain an higher level license, including specialties as: wreck diving, deep diving, night diving, wetsuit diving, nitrox diving, and DPV. This courses teaches how to prevent and face little emergencies, both underwater and on the surface; formative and challenging! First level of professional diving training. Working with an instructor, the diver will have the chance to improve his or her diving and rescue skills, to be able to forestall and solve problems. Isolotto (little Island) of Porto Ercole, Scoglio Sommerso, Punta Avoltore, Cala dei Santi, Punta Naso di Papa, Grotta Azzurra, Punta Finestra. Giannutri Island, Scoglio del Corallo, Argentarola, Cala Grande, Capo d’ Uomo Shoal, Presidente Shoal, Cernia Shoal, Zi Tof Shoal.